It would be easy for some to think that growing your Facebook fan base is a waste of time given that, on average, only 16% of a brand’s fan base sees their organic posts. Why not put all your money into promoted posts? Two words: social context. Brands with more fans have social context in their ads, essentially acting as word of mouth, which is the best kind of advertising you can get. What is Social Context and Why Should I Care? 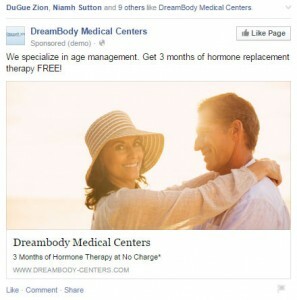 Take a look at the Facebook for DreamBody, one of Zion & Zion’s clients, shown here. This ad is meant to drive users to a landing page where they can sign up for an offer. The fact that I can see that my friends “DuGue Zion, Niamh Sutton and 9 others like DreamBody Medical Centers” gives the brand credibility. The only way your ad will show that social context is if you have fans that are friends with the user seeing your ad. For this reason, growing your fan base is very important. A growing fan base makes your ads work better. Facebook’s Brian Boland explained that ads with social context, on average, drive 50% more recall and 35% higher online sales lift. Whether you are running a website conversion ad (like the DreamBody ad) or even a Like ad (like the Goodwill ad), when your ads contain social context, they become more relevant to the targeted user. Boland discussed two other significant advantages to growing your fan base: reduced ad costs and deep user insights. Fans make the ads you run on Facebook more efficient in Faceook’s ad auction. Ads with social context are a signal of positive quality of the ad, and lead to better auction prices. You can use insights about your fans—such as where they live, their likes, and interests—to make informed decisions in order to reach your current and prospective customers. I would like to add another benefit to this list: an increase in social impressions. When users engage with your ad (or organic post) by liking, commenting, or sharing, sometimes that engagement will show up in their friend’s news feed, thereby garnering social impressions that you don’t have to pay for (read: free). As your fan base grows, assuming all fans engage at a similar rate, social impressions will grow in tandem. Now let’s talk more about return on investment (ROI). According to research by ComScore in 2011, a brand’s Facebook fans spend more than the average brand user. ComScore studied three companies: Starbucks, Southwest Airlines, and Bing. Starbucks’ Facebook fans and friends of fans spent 8% more than other Starbucks customers who were not Facebook fans. Southwest Airlines’ fans visited Southwest.com 12.4% more than other Southwest customers who were not Facebook fans. And friends of Southwest fans visited the site 7.1% more. Bing Fans conducted 68% more searches on Bing than the average Bing searcher while Friends of Fans conducted 27% more. Does Organic Content Matter Anymore? Yes. Yes. A thousand times yes. For Facebook users to be persuaded to like your brand page or comment on your brand’s post, it has to be interesting and relevant to their lives (fan base insights come in handy here). In traditional marketing, we all know that well-targeted media without good creative will fall flat, and good creative targeted to the wrong audience will not resonate. The same is true with Facebook ads. Both must be employed. You soon learn which topics and style of post interest your audience most. Organic posts are the perfect testing ground to know which posts you should be promoting. As for metrics, be sure to measure engaged users/post reach (rather than total fans), because users can’t engage with something if they never saw the post! How Should I Allocate My Facebook Budget? This is not an exact science and will vary by brand. Some brands can get away with 100% of their budget going to promoted posts because the content of their posts is so engaging. 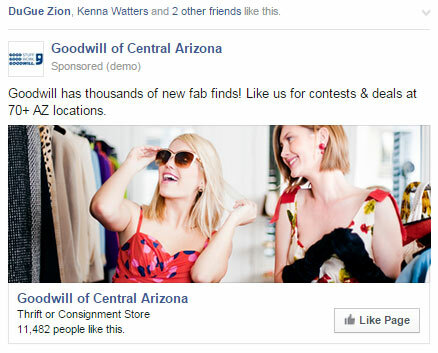 Some brands will need to divert more funds to “like” ads in order to gain momentum. I recommend starting with a small budget for each campaign objective you want to achieve. Allow the campaign to run long enough to generate enough impressions before deciding to nix a particular ad. Two weeks is usually a good time frame to measure results. You’ll start to set your own benchmarks for metrics such as “Cost per Like,” “Cost per Engagement,” and “Cost per Conversion.” For some reason, a $1-$3 Cost per Like has become the generally accepted Facebook benchmark among media buyers—but you might be able to exceed those figures, or you might not. If your brand sells Depend diapers, you might have a tougher time getting Likes. If you’re a pizza company, it might be easy as pie. Once you feel good about the ads and targeting you’re using, ramp up the campaign to increase your reach and frequency. Our goal in advertising is always to get the most bang for our buck, so continue to test new imagery, copy, and targeting methods until you find a combination that works. You might even need to update your landing page (in the case of a website conversion campaign). Are users seeing what they expected to see after clicking on your ad? Don’t surprise or confuse them unless you want to reduce your conversion rate. Facebook recently took a page out of Google’s book and introduced Relevance Score to their ad ratings. A score of 1 to 10 indicates how well your ad is suited to your target audience. The higher the score, the less you’ll pay for an impression. So it pays to make sure your copy and imagery are aligned with who you’re targeting! Remember: relevance score is not the be-all-end-all as long as you’re reaching or exceeding your goals (CPL, CPA, etc). And if this sounds like too much hard work, then give us a ring or shoot us an email, and we’ll be happy to help!